…was born in 1882 in the town of Torzhok (Tver Province), to the petit bourgeois family of a ladies’ tailor. He received his education at home. In his younger years he worked as a shepherd. 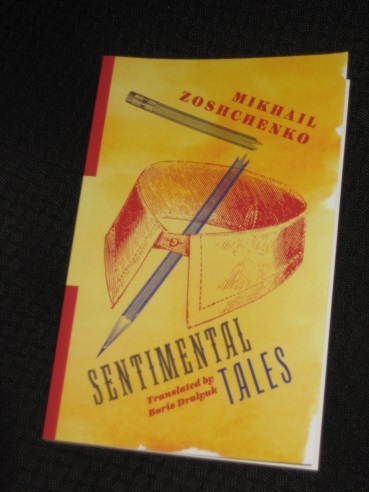 As you might have gathered from this rather tongue-in-cheek biography, Kolenkorov is merely the invention of the true author, Mikhail Zoshchenko, a satirist writing in the 1920s, a time (according to Dralyuk’s introduction) when there was a little more leeway in literature than was the case later under Stalin. These stories were both a playful look at provincial society and the introduction of a writer with an inability to dwell on the finer things in life. Several of the stories, despite the comic feel, have a slight air of existential angst. Both ‘Apollo and Tamara’ and ‘People’ feature a central character who is disappointed by life, with early success followed by an inevitable downward spiral. The latter story, perhaps the pick of the collection, sees the man gradually turn away from society and end up muddied and maddened, more an animal than a man. And yet, despite all this, Ivan Petrovich Belokopytov adored the quiet, peaceful country life. He loved raw milk, which he imbibed in staggering quantities, and he was fond of horse riding. Never a day passed that Ivan Petrovich didn’t go out on horseback, so as to admire the beauty of nature or the babbling of one or another forest brook. Belokopytov the elder died young, in the full flower of his activity. He was crushed by his own horse. Even when the action turns a little darker, he always finds a way to lighten the tension, which is unsurprising. In his guise of Kolenkorov, he discusses his literary preferences at one point, expressing a love of bright, uplifting foreign works over the gloomy books of his countrymen. He certainly practices what he preaches. But here the author must interject and say that he’s no snot-nosed kid, to go on in this way, describing sentimental scenes. And although there isn’t much of that stuff left, the author must move on to the hero’s psychology, deliberately omitting two or three intimate, sentimental details, such as: Tamara combing Apollo’s matted hair, wiping his haggard face with a towel, and sprinkling him with Persian Lilac… The author states unequivocally that he has no truck with these details and is interested solely in psychology. These lengthy introductions are wonderfully written, and it can be difficult to decide at times whether they or the stories are the actual focus of the book. I must confess that I was often more interested in Kolenkorov’s confessions than those of his subjects. It was the month of May, and this wonderful time of year – with its beauty, fresh colors, and light, intoxicating air – inspired them no end. The author, unfortunately, lacks major poetic gifts and finds it difficult to wield poetic vocabulary. It truly pains him that he has little aptitude for artistic description and, in general, for literary prose. So why smear our life in print and thicken the black colors? We see enough boring, awful stuff during these transitional days, so why add to it in literature? Will be adding this tbr lists..thank you..
Well, I thought this was a wonderful book, and like you I found the digressions of Kolenkorov most entertaining. And I thought the use of satire to critique the regime was so much in the spirit of Russian satire generally, with plenty of pathos built in. As you say, Dralyuk did a marvellous job with the translation!